The Hashimoto's test measures blood markers related to Hashimoto's disease. What is the Hashimoto's test panel? The Hashimoto's blood test panel measures the free & total T3, free & total T4, thyroglobulin antibodies, TPO antibodies, and TSH blood levels. Why is the Hashimoto's test important? The Hashimoto's blood test panel helps screen for Hashimoto's disease. This Hashimoto's Test Panel is a blood test. The Hashimoto's test panel, also known as a Hashimoto's blood test and Hashimoto's lab test panel, measures blood markers that help screen for Hashimoto's thyroiditis. Hashimoto's thyroid disease, sometimes known as chronic lymphocytic thyroiditis, is caused by gradual destruction of thyroid cells from an overactive immune system. Hashimoto's leads to ongoing inflammation of the thyroid and, over time, a decreased ability to produce thyroid hormones. Because Hashimoto's thyroiditis is a specific form of hypothyroidism, this Hashimoto's test panel was designed as a more detailed version of the hypothyroidism test panel. This Hashimoto's test panel includes the free T3 test, free T4 test, thyroglobulin antibody test, total T3 test, total T4 test, TPO test, and TSH test. Hashimoto's blood testing will, in many cases, demonstrate an elevated TSH level. As T3 and T4 thyroid hormone production dips with thyroid gland damage, TSH levels go up in an effort to stimulate the thyroid to produce more hormone. While the T3 and T4 levels can be stable or even slightly elevated for a while, they will tend to decline as more of the thyroid is damaged over time. Two other important blood markers measured in the Hashimoto's test panel include the TPO (thyroid peroxidase) antibodies and the thyroglobulin antibodies tests. These antibody tests measure components of the immune system that cause the actual damage to the thyroid gland. In most cases, one or both of these antibodies will be elevated, highlighting the immune system's role in causing the thyroid to be underactive. To get a Hashimoto's test near you, order online and get your blood drawn at the Quest Diagnostics lab that you selected. 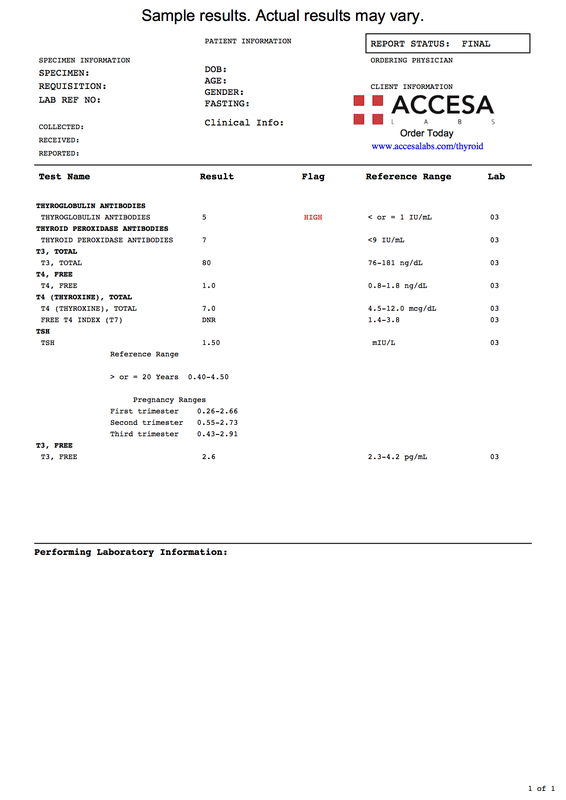 Once your Hashimoto's panel lab results are ready, they will be available for download. As can be seen on the sample Hashimoto's test panel lab report, the Hashimoto's panel components are reported as numbers and can be compared against the reference ranges provided by the lab. According to the American Thyroid Association (ATA), it is the most common cause of low thyroid activity in the United States. For an even more detailed thyroid panel, please see comprehensive thyroid test panel. Hashimoto's Test Panel at Guaranteed Prices.